The end of October already. Summer is too soon gone. Sigh! The Boston area got snow yesterday! Enough to cover the grass and stick to the leaves that haven’t fallen yet, but only a bit of slush on the road. It worked out perfectly for me, because I short-cut the lawn again yesterday morning before anything started falling from the sky, and then put down my winterizer lawn fertilizer. An hour or so after that it started snowing, and the grass and new fertilizer got a nice moist covering of snow to help the winterizer seep slowly into the ground to the roots. I couldn’t have asked for better timing! I’ve begun building a new server for the house. I picked up an MSI (P4MAM2-V) motherboard and a new-style Intel Pentium-4 (2.66 GHz, with a 533 MHz hyper-threading bus) CPU bundled together on sale in September for $80 ($110 off list). A week or so into October I found 1 GB DDR DRAM boards for $119 on-line, so I picked up one of those. I had a spare 200 GB drive, and an old CD-ROM drive that came out of my main machine when I bought the DVD-Writer. All I needed was a chassis and a power supply, and MicroCenter had them on sale this week ($20 for the mid-tower chassis and $40 for a 450W power supply). So my new 2.66 MHz hyper-threaded P-4 with a Gig of memory and a 200 GB drive cost me about $260 total. I put it together last night and I’m configuring it now. I’ve been traveling a lot lately, and more to come in November. I made 2 week-long trips to DC in October, and so far I’m scheduled for 3 more days down there the first full week of November, and then a week down in Fort Walton Beach FL the week after that. The only good part is that I’ll easily make my Silver Preferred frequent flyer again with USAir. Tomorrow is Halloween. 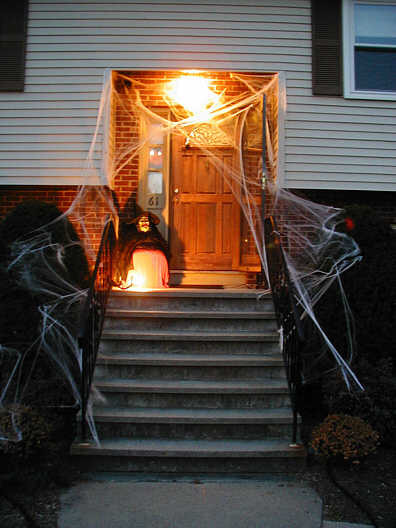 We’ll do our usual set-up for the kiddies; spider-webs all over the front door area, cover the lights with orange cellophane, put a scary-looking witch-dummy sitting on a small chair by the front door, then wire the whole place for sound. We play scary sound effects and Halloween music, and when kids come to the door, the witch talks to them because the sound system is also a PA system with a microphone in the house! This is what the decorations look like around the front door. It used to be that we were the best- (only?) decorated house in the neighborhood for Halloween night. A bunch of neighbors have caught up with us over the years, and some have surpassed us (strobes, fog machines, coffins, headstones, etc. ), but we don’t feel the need to ratchet it up to keep up. It’s enough as it is. This entry was posted in General, House, Technology. Bookmark the permalink.